Golf season just about ended today here in Michigan. We have received some unseasonably warm weather for the first week of November. I was walking around outside today in shorts and a long sleeve shirt. It looks like winter is going to be creeping in by the weekend so I’m glad I got in a round of golf the other day. Golfing is one of my favorite activities to do. I am not on a league but probably get out 4 times a month. During high school I played on the golf team so I was not so bad. My average was in the low 40’s back then when I was playing 4 days a week. Should have been better thinking about it now and I know why I was not. Its all because of fitness. I was not a “fat kid” to say but I could have enjoyed playing sports and golf more if I was in shape. This was my first summer playing golf while doing the P90X workout. Some of the courses I usually play are Fern Hill, Rammler, and Plum Brook. I live in Sterling Heights, MI and these courses are about a mile away. Prices are reasonable and usually you can just go up there with out a tee time. I guess that’s what happens in a crappy Michigan economy. The first thing I noticed this year was how much farther I was hitting my clubs. I bought myself a Taylor Made R5 Draw Driver for me for Christmas two years ago. I thought I was crushing the ball last year, you should have seen how surprised I was this year when I put another 15 yards on top of the 25 I put on last year just because of the club. My brother was even amazed with it. He was doing P90X with me in the beginning but did not stick with the program the whole way through. He did not quite get the same P90X results as I did mainly because he did not work as hard. What I noticed a lot over the summer was the same par 4 holes I was hitting driver and 4 iron into, I was now hitting driver and 8 iron. What a big difference it makes when you know you can hit the golf ball 70% of the way to the green on the first swing. My confidence started to grow very quickly. I hit the ball straight most of the time but even when I would slice one it would still get way out there. Compared to last year I would still be some 50 yards further and even if it was not a great lie I could get out of it or at least be able to advance the ball further where my next shot I was still hitting a 8 iron (my money club) instead of a 4 iron. More scores on average probably dropped about 2 shots per round than from last year. It probably would have been 2 more if I would have been practicing my short game and putting. That old saying of “drive for show and putt for dough” could not be any truer. My wedges and putter did not get me that much help in the score column. I’d be lying if I told you I didn’t go for a couple shots that I knew I could not have cleared last year and almost did it this year. Even though its not tournament play I still count my penalty strokes. This way even if I shot the same score as last year but had 3 more penalty strokes trying to see how far I could crush it I felt like I was improving. This way I now know my strength. Next time those 3 penalty strokes will not be there and I will probably be shooting in the high 30’s. Some of the highlights of this year where playing at some nice courses. I was two months into P90X when I went down to Cancun, Mexico. 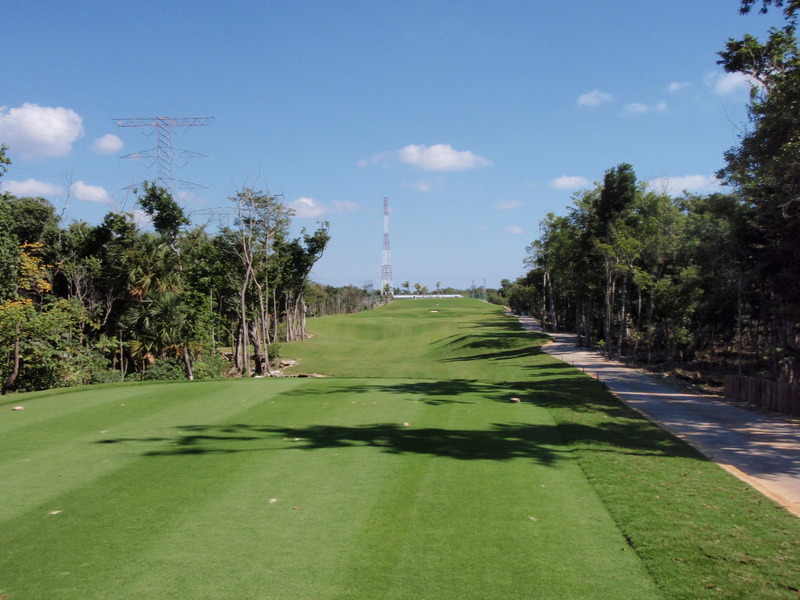 I played a course called Iberostar. Very nice course with Iguanas every where. This is when I first started feeling the new strength. I was out driving the people in my group by 30-50 yards every time with a rental set of clubs. Probably the biggest highlight of the year came when I played at Sanctuary Lakes Golf Course in Troy, MI. It was a windy day out there but their 10th hole is up on a hill and is about 420 yards long. Its pretty much a straight shot to the hole but I was feeling like I wanted to unload on a drive. I crushed a drive and the wind was pushing it back from right to left. When the ball came down it hit the cart path and bounced towards the middle of the fairway. That ball ended up going 360 yards!! I was so pumped. Sure, the cart path added another 15 yards on the hop, but it still went over 330 with out it. Definitely my longest drive ever. This was only a couple weeks ago too. I wish I could have gotten out more than I did this year but it still was an enjoyable year. Knowing that I can hit the long ball it made my game that much easier to control. With more practice on the short game and putter along with P90X I could definitely be shooting in the high 30’s for 9 holes. If you are looking for a great golf workout then I highly suggest buying the P90X DVDs. You will not only help your golf swing but your overall fitness.